The pattern that I used to learn flat braid join is called Lacy Lapghan (PDF), from Priscila’s website. Now I use some type of variation of FBJ for almost all of my projects. Okay, so lets get to it! Due to a high number of requests, I have made my pattern library more organized and browse-friendly, which means this pattern has been relocated to my crafter site! Posted in Free Patterns, Textured CirclesTagged Crochet, FBJ, Join, Tip: JoiningBookmark the permalink. I made 9 squares of the Textured Circles blanket for a baby, it was so easy to make, it went really fast. I understand how to work the flat braid join, but I have never worked a join as you go blanket, so I am stumped, should I make rows and then join the next row, I have a lot of stops and starts. I made 9 squares, I plan on making a 3 x 3 square blanket. If you can maybe just make a drawing and number the boxes that would be a big help. Also, I am left handed, so I guess I am going the opposite way everyone else is…thank you so much for any help. I want to keep making these blankets, but if I can’t join them…..
What I would do is lay the squares out how you want them to look in a 3×3 grid on the floor. I don’t think it matters if you’re right or left handed. Start in any corner and with the solid border color, work an SC round (3SC in corners). Work your loopy flat braid join round (Ch2, Sk1 st, SC) around, Ch4 at the corners, making sure there are an equal number of “chain loops” on each side, that way when you join the next square, you won’t run into trouble. Okay, so you have completed the first square. When you join as you go, you’ll always work the first motif to completion, then each subsequent square is joined on the last round. So take your next motif across (#2) and work one side of the motif, attach flat braid style on the next side, and work the remaining two sides without joining anything. Note: remember to “connect” outer-perimeter corners… I hope I’m clear about that in the flat braid join tutorial. Take motif #3 and join as with #2. On motif #4, you’ll be working the first side like normal, then join to the bottom of motif #1. Be sure to connect the bottom left corner of motif #2 and leave the bottom right corner of motif #1 alone (you’ll be picking it up when you work motif #5). Work the other 2 sides to complete. Motif #5 will be your first square to join 2 sides. Work 1 side as always, pick up the bottom left corner from #3, join to the bottom of square #2, join to the side of square #4, work last side, and done. Continue in this manner joining one square at a time. It doesn’t matter which corner you start in or if you work right to left. Let me know if I can clarify anything! I am certainly not known for my brevity, so I tend to over-explain! Thank you so much for the directions. Worked like a charm once I remembered that yes, left hand directions are different, I had to crochet the squares in the opposite direction, I started with my #1 on the right top corner and worked back that way, because leftys crochet left to right, the opposite of rightys. Thanks so much for the directions. I was confused on what to do with the not joined corners and looking at the pic was making me more confused. I forgot to ask if you attach all four corners together on #5, and if so how? Thank you! On square #5 (the center square) you will hook up corners like this: squares 1 and 3 picked up by the top corners of square 5, and leave the bottom 2 corners of square 5 unworked. Then when you work squares 7 and 9, then the bottom corners of square 5 will be picked up. The main thing to watch is how you’re making the “x” formations. Make sure they are crossed over the same way over the whole blanket. How useful – and oh! how I wish I’d seen this earlier (when sewing up two bolster cushions, each with around 36 squares and circular ends). I gave up trying to crochet neatly, and went with a blanket stitch in the end… Great tutorial. I am struggling with this. Reading your reply to Maria I believe would be helpful however I am confused with this. You say On motif #4, you’ll be working the first side like normal, then join to the bottom of motif #1. Be sure to connect the bottom left corner of motif #2 and leave the bottom right corner of motif #1 alone (you’ll be picking it up when you work motif #5). BUT…now when you talk about motif 5 you never say where to pick up the bottom right corner of #1. Please help!!! I am trying to finish up a lapghan for my mother who is suffering with alzheimers. My pattern is going to be 3 squares wide by 5 squares long. I just need to know when to pick up the bottom of #1 and if I should have more then 2 corners together at any point. When a corner in progress meets a diagonal corner, it picks it up. So the bottom right corner of square 1 is picked up from its diagonal, which is the top left of square #5. So, square #5: work 1 side as normal, pick up bottom left corner of square #3, join across bottom of square #2, pick up bottom right corner of square #1, join to right side of square #4, leave bottom right corner of square #4 unworked, finish bottom side and join. On every row of squares, all corners from the row directly above it will be picked up. Then when you get to the bottom row of squares, you will join corners at the bottom because you’re at the perimeter of the blanket. all outside corners are joined immediately. I am in the same way. She forgot #1, but I attached #5 to #1 anyway. But in the pictures, it looked like in some way she joined all 4 corners but I do not know how. Hi Rachele. I’m one of your Facebook fans and I’m in the process of making my own afghan, but wondering how I’m going to join the squares. I’m wondering about using your flatbraid join but I have a few questions, which I hope you don’t mind answering (at the risk of me sounding like a dummy). The pattern I’m using is Red Heart’s sunny spread and the last round comprises 80 sc, hence the use of the flatbraid, which I love, by the way. 1. Do you work the first round of the join on all the squares first? That is, the sc round? 2. Just to be clear then, you work the second round (the chain round) on the first square and then just on one side of the square to be joined? 3. 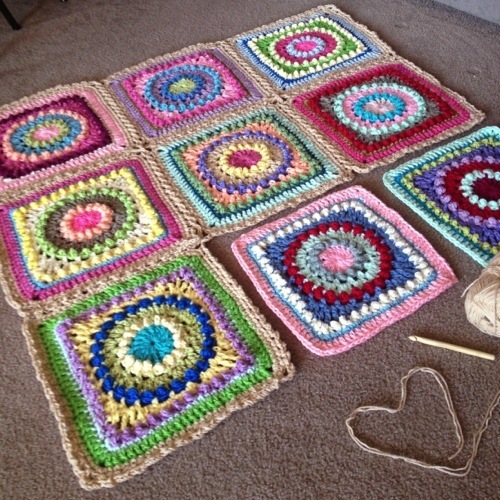 Are you joining the squares up in the same order that Crochet Cabana does on her chart in her Continuous Join as you go method? 4. Joining the corners is where you lost me I’m afraid. When you say leave the corners alone until you pick them up when the matching diagonals are ready to be joined, what are you doing with your working yarn? When you reach the corner, are you cutting and fastening off your yarn? I’m sorry but this really confused me. Have you thought of a video tutorial? I think it might be clearer what you’re doing. 1) I don’t work all SC rounds first.. I cut yarn as little as possible, so I work SC round and then joining (chain) round. 2) You work the complete first motif and then on subsequent motifs, you still work the complete chain round, but whichever sides will end up touching your completed motif, you join those sides together. 3) With this method you can start anywhere! Yes this is exactly right. After you work the adjacent joining sides, you complete the motif plain (there is nothing left to join. You cut yarn after the chain round is joined to its beginning stitch. Buen día. De todas las uniones que he visto, esta es la que más me gusta. ¿Sería posible ver un pequeño vídeo de como se hace?, pués con fotos me cuesta de entender. Hi! Will this stitch work with an octagon and square blanket? I have 30 octagons, 20 squares, and 18 triangles (for the edges). I’d really like to do the flat braid join but can’t find any examples of using it with octagons. If you have any other suggestions I’m all ears (eyes?). Love your posts! I agree about weaving the ends, and it preserves so much integrity if it’s continuous instead. I have 88 squares to join. Is there a trick to join them in rows so I don’t have 88 more tails to weave in? Or am I just doing it incorrectly? Oh, wonderful! I’ll be anxiously awaiting your continuous flat braid tutorial today. Thanks so much for the reply and the lovely patterns. What happens it you do not have the same amount of chain three loops. On my first square I have 9 chain three spaces, then corner chain four, then 10 chain three spaces, then corner chain four, then 9 chain three spaces, then corner chain four, then 10 chain three spaces. Do I need to fudge so they all have the same spaces? Pingback: Yarn Clouds Blanket | Goats and Hounds! Hello! I am wondering whether this method FBJ could be used to join some hexagonal granny type pieces. I made bunches of them a few years ago but I didn’t join them bcuz I hadn’t seen any method that I really loved.